This past week we had cold weather. After temperatures well in the 80s its very hard going back to low 50s! Especially for kids, who want to play outside all day. By about day three of this weather, we decided to surprise the kids and take them to a bounce house to burn off energy. Best money we have ever spent. It was our son’s first time, at 21 months old. Despite being 8 months pregnant, I had no issues climbing up into the bouncers. (Okay, that’s a lie, it hurt like heck and made me take a long nap that afternoon!) I did it anyway to make sure my little guy could make it up himself. I’m not sure what I was thinking, he is a climber, and a fearless one at that! After climbing with him two or three times and showing him that it was a giant slide he decided that waiting for his slow, pregnant, mom was not important. He took off without me! I was terrified the first dozen times watching him zoom down those slides without me with him. But I came to realize that he was quite capable of doing it himself. I had to make myself take a step back and encourage his independence. It might have been the hardest thing I’ve had to do, he’s not even two yet! At the same time, I was insanely proud of him for venturing on his own. Always looking to make sure that Daddy and I were watching him. Then, most importantly having a blast. His nap that day, a whopping 3 hours! Mine was nearly that long too. 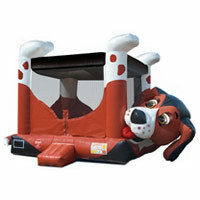 So if you have energy to burn, try taking your kids to your local Jump Zone, or other bounce house. It is absolutely worth it!